TWO construction companies were charged in the Petaling Jaya Sessions Court for failing to ensure the safety of others in connection with the collapse of the Jaya Supermarket last year. 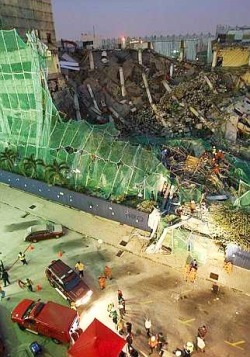 The iconic supermarket collapsed during demolition work and killed seven construction workers on May 28 last year. Representative: Hee leaving the Petaling Jaya court complex after appearing on behalf of Lian Hup Earth Work and Construction Sdn Bhd. Directors Yap Choon Wai, of CW Yap Sdn Bhd and Jason Hee Kok Hing, of Lian Hup Earth Work and Construction Sdn Bhd, appeared on behalf of their companies and pleaded not guilty to the offences. Both were charged at separate Sessions Courts in Petaling Jaya yesterday. CW Yap Sdn Bhd was charged as an employer for failing to ensure that non-employees, namely four workers and three civilians, who could be affected by the company’s works, were not exposed to safety and health risks. The company was charged with failing to comply with the work safety system provided in demolition works for buildings. Lian Hup Earth Work and Construction Sdn Bhd was charged as an employer for failing to ensure the safety, health and welfare of all its employees on duty by failing to comply with the work safety system provided in demolition works for buildings. Both companies allegedly committed the offences on May 28 last year at about 5pm at the site of the proposed project to demolish the office building and shopping complex at Jalan Semangat here. The proposed project was also set to rebuild a seven-floor shopping complex building and a four-level basement car park at the site. Sessions Court Judge Hayatul Akmal Abdul Aziz fixed Sept 27 for CW Yap Sdn Bhd’s case to be mentioned. In ruins: A picture taken when the Jaya Supermarket collapsed last year. Later, in another Sessions Court, judge Rozina Ayob allowed for Lian Hup Earth Work and Construction Sdn Bhd’s case to be mentioned on the same day and at the same court with CW Yap Sdn Bhd’s charge. CW Yap Sdn Bhd and Lian Hup Earth Work and Construction Sdn Bhd were each charged under Section 17(1) and Section 15(1) of the Occupational Safety and Health Act 1994 which is punishable under Section 19 of the same Act. Those convicted under this Section could be fined up to RM50,000 or jailed for a term not exceeding two years or both. Both companies were represented by defence counsel Ooi Huey Min while Department of Occupational Safety and Health prosecuting officers Jaafar Leman and Hazlina Yon appeared for the prosecution.